Student Competition "The lagoon Lake Atanasovsko"
Natural History Museum Burgas in partnership with the project "The Salt of Life", funded by the LIFE + Programme of the European Union and the local Inspectorate of the Bulgarian Ministry of Education organize a student competition for the design of promotional materials for Lake Atanaskovsko. The competition is open to all students from school class I to XII in the city of Burgas. The competitors will be divided into two age groups - from I to IV class making ​​cards and / or leaflets and V to XII class making booklet and / or audio clip. Deadline is 25.01.2013, projects submission in paper at the Natural History Museum of Burgas (address: Burgas, ul.Konstantin Fotinov 30). The winner will be announced on the 01.02.2013. 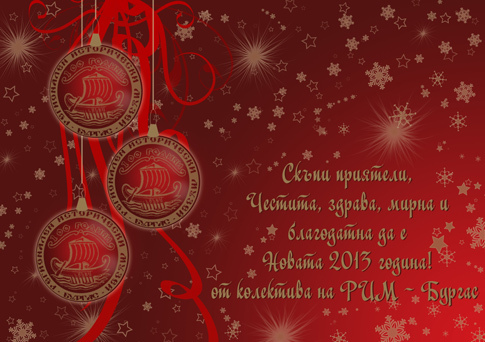 Regional Historical Museum Burgas wishes You Merry Christmas and Happy New Year! All four expositions of Regional Museum Burgas will be closed in the period between 22.12.2012 - 01.01.2013. Have a great holiday! Merry Christmas and Happy New Year! To view the exhibition "100 years Burgas Museum" in .pdf format, click on the link inside the text or on the picture below. Full gallery of the 100th anniversary celebration, please visit our Facebook page. 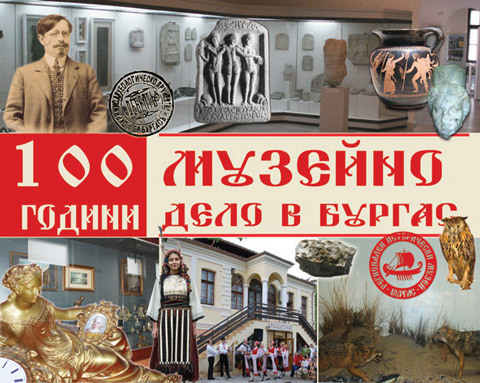 Location: Historical exposition, Burgas, 31 Lermontov St.
"100 Years Regional Museum Burgas"
Students from the Burgas Schools "St. Cyril and Methodius" and "Bratya Miladinovi" will participate with their works dedicated to St.Nicolas Day. Natural-History Museum Burgas and Kindergarten Sluntse will celebrate December 6 with "Tales and legends of St. Nicholas the Wonderworker, people and marine life"
On December 6, 2012 (Thursday) at 10.00 hours in the Natural exposition of Regional Museum Burgas, St. Nicholas Day will celebrate with a performance by the little artists from Kindergarten "Sluntse" named "Tales and legends of St. Nicholas the Wonderworker, people and marine life". Colorful fishes, crabs and other marine organisms made ​​by children from kindergarten "Sluntse" will adorn the museum. The celebration dedicated to St. Nicholas will begin with brief information about the life and works of the saint - the protector of our city. The Dramatization "The Fisherman and the Goldfish", songs and poems on a nautical theme will be performed by our young guests. Prepared by the Museum's curators photos, games and interesting quizzes about the seaside dwellers will enrich the children's knowledge. The kids will learn how to make sailboats from natural materials and will create origami of different marine dwellers. 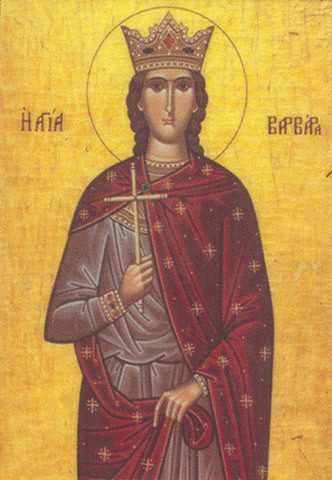 St. Barbara is a Christian saint and martyr honoured among both Orthodox and Catholics. In the popular believes of the Bulgarians St.Sava and St. Barbara are sisters or servants of St. Nicholas. Thus they prepared his feast, as we learn also from the saying "Barbara kneads (boils), Sava bakes, Nicolas eats (treats the guests)". A candle specially designed for St.Barbara is lightened on top of the ritual bread. This candle is very long, has magical powers and is kept throughout the year. It is lightened only if necessary, in danger of storms and disease, with the belief that it can calm down the elements and stop all evil. In the morning everyone should eat boiled wheat or corn for a good harvest. If the first guest in the house is a woman, female chicks will hatch. In different parts of Bulgaria the Day of Saint Barbara is celebrated differently. In some parts of the country kids go around the houses, and in others girls called Barbara's maidens. They call for the health and prosperity. Farmers receive them in their houses with joy and give them apples, dried fruits, flour. This is why 4th of December is known as Women's Christmas. In Thrace, this is the first Christmas night, and as in other areas the first Christmas Eve is Ignazhden (St.Ignatius Day). The ritual restricts on this day are also contradictory. Women should not take on any homework, nothing should be put on the fire, but the most important ritual action is the preparation of bread? And the maidens who want to marry, it was on St. Barbara when they could show how working and agile they are. The one, who first bakes bread and then distributed it to relatives and neighbours, will be the first to get married. In the Strandzhan village Izvor, the locals identify the saint with the disease smallpox. In the village of Rosen there is another idea - St. Barbara holds a bowl with honey and dab the children to heal faster. In the various towns and regions, the ritual bread recipes are different, but when spreading the top with honey, all mothers are praying for the same - "St.Barbara help us and protect our children from disease! On the pictures the women from Community Center "Prosveta" in the village of Lyulyakovo present the ritual activities on St.Barbara's day at the Ethnographic complex in Burgas. Ingredients: 3 eggs, 1 kg flour, 1 teaspoon salt, 1 tablespoon sugar, 3 tablespoons vegetable oil or melted butter, ½ liter of milk, yeast the size of a matchbox. Preparation: Mix the crushed yeast with little bit of the milk, sugar and some flour. Allow the yeast to rise. Pour flour into a tray and in the middle set up a "well", where will be put the fuzzy yeast, beaten eggs, salt and fat. Knead the dough as adding milk until it is perfectly smooth. Put the dough in a muslin cloth and drop it in a large pot with lukewarm water, thus the name "kupana banitsa" (bathed banitsa). When the dough is ready, it will float on the water surface more than half size up. Remove it from the cloth and knead it again with flour. Only then it can be shaped and put in an oiled baking form. Over the top spread egg yolk beaten with a little water. Now put it in cold oven. It is important that this bread should not be baked in a preheated oven. Bake at 150°C. To add the end touch, smear the bread with honey. Christmas is coming. This is the time when we feel our souls to be thirsty for love and kindness more than ever. We recognize the need and value the comfort and warmth that give us our home and loved ones. In the spirit of those magical days before Christmas the Orthodox Church celebrates the Day of the Christian family. The biblical narrative takes us further into the depths of history in the family of St. Anne and St. Joachim, the righteous parents of St. Mary. Even before her birth they gave a promise to God that when Mary turned 3 years they will devote her in to spiritual practice. When this day arrived, with flowers and songs, St. Anne and St. Joachim took Mary solemnly to the Jerusalem temple. The child alone ran up the temple' stairs, where she met the priest Zechariah. St. Anne and St. Joachim rejoiced. The family was blessed to dedicate their little daughter in the service of God. The orthodox icon put out on this holiday presents the 3 - year-old St. Mary, mounting the steps and entering the temple. This representation of the biblical event aims to inspire the Christians to lead their children in the temple of God, to teach them to pray and strive for better. The icons' content is a true spiritual guide of the Christian living. They reveal the sacredness of the world and strive for life in harmony. The icon itself is a prayer, and prayer is a conversation with God. By praying we transcend of the earthly doings and become spiritual in our celebration and solemn. So on the day of the Christian family, let us enter the temple and pray in front of the holy icon "Presentation of the Virgin Mary" for the health of our close people and for more good thoughts and deeds. "The kingdom of God is within us" is said in the Scriptures, i.e Virtue is not created outside of us, it just waits for our willingness. 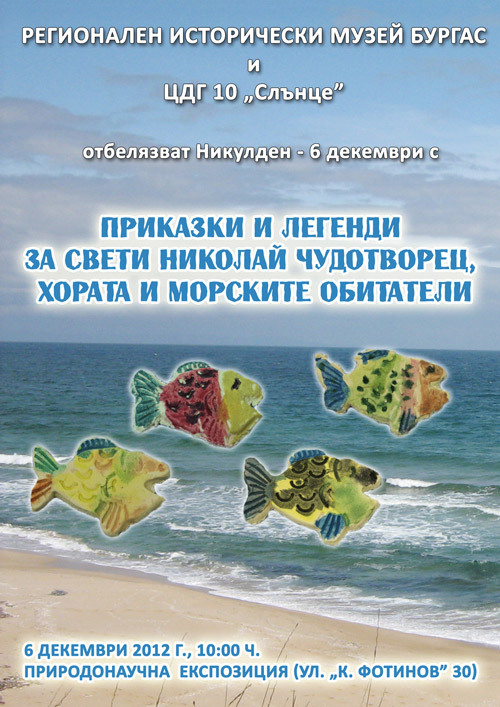 On October 31, 2012 from 13:30 hours in the Natural-History Museum of Burgas (Burgas, 30 K.Fotinov St.) we will mark the International Black Sea Day. Fifth grade children from "St. Knyaz Boris I" School led by Mrs. Metalkova will take part in celebration titled "Inspired by the sea". As children from a city strongly connected with the sea, they will reflect their inspiration in poetry and color. We will write "telegrams to the sea", will draw fishes and sea creatures under the guidance of the art teachers Rosa Boyanova and Vily Koleva. Special guests and participants with small poems will be the children from Literary Studio "Mythical birds". Further festivity on the subject will be brought by a guest exhibition of the Gallery for kids art De'Art. 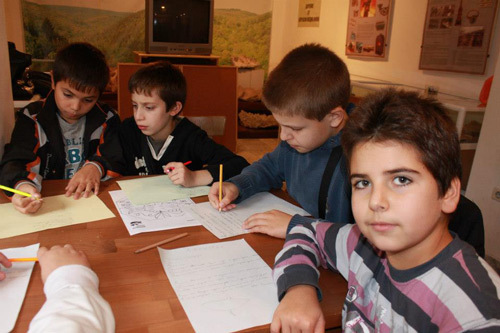 The exhibition includes paintings of the sea drawn by children from Burgas schools and it will stay on display in the Natural-History Museum until Nov. 15, 2012.